4. Reusable bags are essential for those farmers market trips. I think I need a few of these Baggu bags for this Summer. 6. I got a pair of these Turkish T towels recently and I'm hooked- they are light, colorful and perfect for a day at the beach! Have you used those tan towels? I keep trying things and they all make me streaking and orange! Love all of your picks. Tan Towels are the best! my go-to. Jessie, yes I have tried them over and over! I love how they work, and as long as I remember to wash my hands really well after I use one I'm good to go with no streaking! Everything screams spring! Beautiful! Love, love, love those girly J.Crew flats. Couldn't love your choices anymore than I do! Especially tan towels. My saving grace! Wow great picks! Everything is so springy. I think I need those shoes. I love those tanning wipes. My white legs REALLY love them. Loving those flats!!! Super cute and yummy color!!! What fun! All of these brights are so beautiful. We are so happy Spring is here! Loving those J Crew flats - yummy color. I'm going to the beach at 4 today and have been thinking about buying tan towels. I've seen them mentioned twice now in the blogging world and think I need to pick them up on the way. I'm pasty paper white and it is not cute! Loving those Turkish towels. They are so gorgeous! Do we know if the Tan Towels work well? 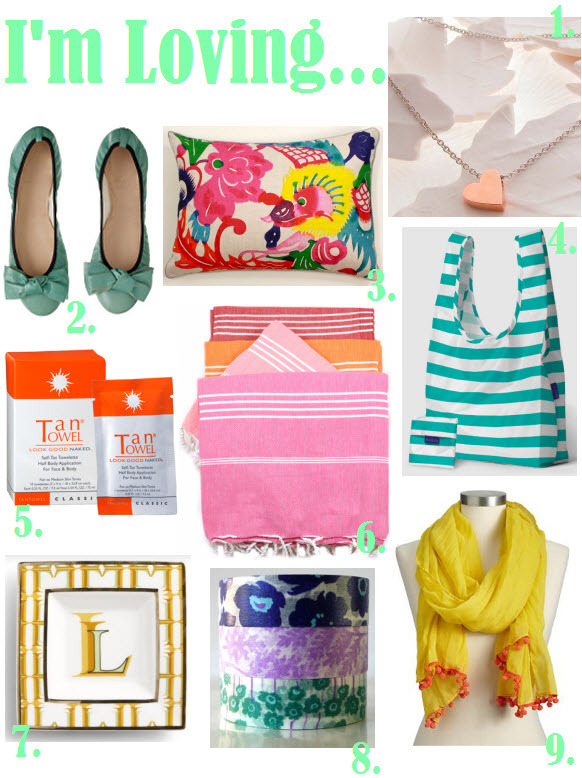 Love your happy spring picks! The Turkish towels are lovely. Been wanting them forever!